Gas Stations Profit from More Than Just Gas Falling gas prices are actually good news to some independent gas station owners, who tend to make more as their wholesale costs drop. But the real money for such retailers lies not in the pump, but inside refrigerator cases. 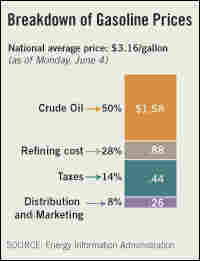 The profit margin for the average gas retailer in 2006 was about 6 percent. Compare that to bottled water, on which gas station owner Andre van der Valk says he makes a profit of about 50 percent to 60 percent. Gasoline prices are falling from near-record highs. The Energy Department says the average price of gas fell by about a nickel per gallon in the past week, as refineries ramped up production and gasoline imports rose. Falling prices are often good news for gas station owners, who tend to hold on to an extra penny or two per gallon as their wholesale prices drop. Andre van der Valk runs a Shell station at the busy corner of Ventura Boulevard and Lindley Avenue in Los Angeles. There is an ARCO station across the street and a Chevron dealer next door. On a recent weekday, van der Valk was selling unleaded regular for $3.45 per gallon. Most of that money goes to the wholesaler. Van der Valk's own share is 12 cents to 14 cents. Of that, he pays about 4 cents in payroll expenses, 4 cents in rent, and another 4 cents in credit card fees. Credit card fees paid by gas stations have increased sharply in recent years, as more drivers use plastic to postpone the pain of high gasoline prices. Subtracting those expenses, there isn't a lot of profit left outside at the gas pumps. 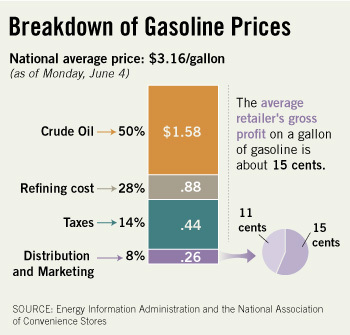 The real money for gasoline retailers is inside, at the refrigerator case. "Forty years ago, there was one Coke machine and one Pepsi machine out there, and you had a choice of maybe two or three brands," van der Valk says. "Now – boom! — you've got a whole cooler." Although cigarettes are the biggest sellers in gas station mini-marts, bottled water is the biggest money maker. "You tend to make at least 50 to 60 percent on a bottle of water," van der Valk says. "Water is more profitable than gasoline." En route to another gas station he owns in neighboring Simi Valley, van der Valk calls his son on a cell phone. "Hey kiddo. Hey, let's go down. $3.39," the elder van der Valk says. The previous night, the wholesale cost of gas for Van der Valk dropped two cents, but he left retail prices alone, hoping to pad his margin a bit. After seeing what competitors are charging, though, van der Valk gives in and drops his price by six cents. He is fortunate that his modern-looking stations were actually built years ago, when both land and construction were cheaper. He points to one new gas station that he figures cost about $5 million to build. "That canopy alone is supposed to be imported tile," he says. "And if you go inside it, it's gorgeous. But we're still selling gasoline. In the back of my mind, I think the consumer says, 'Who paid for this?'" Unlike the Shell station on Ventura Boulevard, van der Valk's Simi Valley location is a so-called "unbranded" station: Instead of buying exclusively from a Shell wholesaler at a Shell-dictated price, van der Valk can shop around for the cheapest gas available. 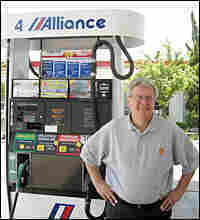 At the moment, the wholesale cost he is paying for this station is about 15 cents a gallon below the Shell station's. Ironically, the gas is coming from the same refinery. "Think about that. And my margin over here is 30 cents a gallon. My margin at the Shell is 12 cents a gallon. So it's more than double," van der Valk says. In general, unbranded stations enjoy lower wholesale costs than branded dealers, although when gas supplies are extremely tight, their prices can be higher. Van der Valk hedges his bets by owning both kinds of stations. Another big money maker at van der Valk's Simi Valley station is a self-serve car wash, something he doesn't have room for back on Ventura Boulevard. He says the car wash brings in about $12,000 a month, and since soap and utilities are the only expenses, it's practically all profit. Customer Tony Acers pulls into the bay and the water nozzles go to work on his white Chevy Blazer. Acers paid $4.99 for the car wash and $1.35 for the Monster energy drink he bought inside. That might seem like an afterthought to someone who has just shelled out more than $30 for a tank of gasoline. But for van der Valk, the drink and the car wash are where he really cleans up.